I have had the privilege to work with many engineering and technology companies in a short space of time on equality, diversity and inclusion activities. This puts one in a position to see themes come up across an entire industry. Rest assured, the barriers people are facing are fairly similar across the piste. And it’s my mission with EqualEngineers to fast-track lessons being learned with one another. So, in the spirit of shared-learnings, I thought I would start with a mind-dump of common things I see come up. Note: I originally started this blog with “7 top tips”…but then just kept writing! I will come back and add to this list as new top tips spring up. And if you have any to offer, please share! But why…why….why”…remember being like that as a child? The inquisitiveness to understand why…or perhaps the frustration as an adult answering such questions to a child who will not be satiated with any response you give? This can be how proponents of diversity and inclusion can feel. People will challenge most activities you try and do on diversity and inclusion, but will be quietly thankful in the end. Keep calm and carry on. People will see it as not their responsibility. Have your elevator pitch ready at hand to use whenever an opportunity arises to educate. Keep it brief, simple and easy to remember. But most importantly, make it relatable for the individual. They’ll remember the why. Ensure network groups are open to everyone, and communicate, communicate, communicate that this is the case. Want to increase the number of men in the room at a women’s network event? Rebrand the network to a gender balance network, and run events in such a fashion. Engage the male majority in diversity efforts, and help them find their voice as part of the diversity conversation such that they feel included. Using statistics around male suicide rates in construction is an incredibly powerful method to highlight importance of positive mental health and wellbeing and how crucial it is to create an open and inclusive culture where people can open up about anything which is on their mind. Support the people who want to go above and beyond to make change happen. Those who ask “is there a timecode for this?” are unlikely to give what you need from them in the early days for getting your work set up. Initially, D&I efforts benefit from being turbo-charged with resource(s) to oversee it. Expecting people to do it on the side of their day-job will not likely yield the potential return that it can, because it will always be down-prioritised. In time, it should become part of business process. But you will only get that with proactive coordination. Define what working and operating inclusively looks like for each function/division: recruitment, sales, marketing, communications, business development, operations, service delivery, management, finance, human resources, health and safety, talent development (etc.). Update policies and procedures and support changes needed to embody this. Understand your employee value proposition. Why do people work for you? Your employees are your best consultants. Ask them. Understand your employee value proposition. Why do people leave your organisation? Your (about to be former) employees are your best consultants. Ask them. If you are an executive or senior leader who says you want a more diverse and inclusive organisation, then shout it loud and proud. Get personal. Say why you want this. And this doesn’t mean regurgitating statistics from McKinsey on the business benefits! People just don’t get excited by that. (Yes, honestly, they don’t…trust me, I’ve been there often enough). Personal stories work, lived experiences of colleagues, or the groups you are trying to attract to your business. Invoking empathy makes for a much more powerful intervention. Intervention does not equal transformation. Culture change takes time. Strap in for the long haul. Some things cannot be quantified, as much as you might want them to be. D&I (can) be messy, it involves emotions, it pushes your organisational politics to the limit, it challenges the micro-cultures which make up your entity, it brings out those leaders and managers who are blockers, as opposed to enablers. How are you going to handle them? Some of the main issues may rest within as opposed to external. Ensure the image you portray externally reflects the reality internally. Using stock imagery in recruitment campaigns? That’s a big no no. Photograph and record real employees doing their real jobs. That’s authentic. What are your parental leave and pay policies? This can be where gaps start to widen between men and women, and men have to go back to work as they may be the primary earners and have insufficient leave entitlement. Setting up network groups? Consider initiating a carers network. And leave out “parents” in the title since “carers” already captures this. 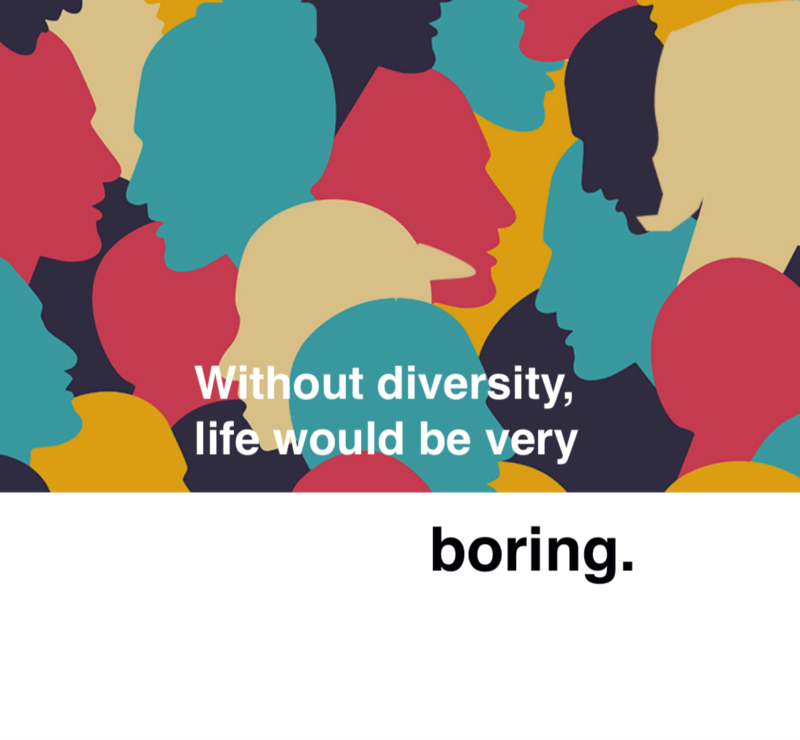 This network group can be less polarising for the organisation than other diversity strands. How “flexi” is your “flexitime”? The UK has an ageing population with people living longer. Guess what? Flexitime requests will not exclusively be coming from new parents…it could be from older employees wanting a phased retirement, or having to look after elderly relatives, or just from someone who wants more time to pursue other things in life with better balance to how they earn their keep. Adopting a single form of “flexitime” is not really that flexible. Supplier diversity. How can you support your supply chain be proactive on diversity and inclusion, especially small-medium-enterprises? Could you source services from minority-owned businesses? Host supplier-diversity days where you get your supply chain all together to share good practice, and report on progress. What gets measured gets monitored. Baselining is important, to know if the changes you are implementing are being effective. This does help quantify return-on-investment. Is “stuff” actually changing? Use surveys to solicit feedback from your workforce on changes. Your people are your best consultants. How can you involve contractors? They are part of your organisation, project team, bid team etc. Is there a way you can accommodate them within your D&I workstream without creating an automatic barrier? It can be hard, but not impossible. Struggling with gender diversity in technical roles? How about filling technical roles vacancies with women from business support roles? Offer them the opportunity to retrain and become engineers via distance learning, enrolling on an apprenticeship…however you achieve it, this is one way to increase the percentage of women in technical roles by asking people already familiar with your business, and presenting an alternative career pathway for them. Plus, it’s (usually) easier to backfill diversity in business support functions than achieving it within the technical roles. Obviously, this is not going to hit the numbers needed, but it could be something to consider to complement your talent management strategy. Are you visiting the same universities year-on-year for graduate recruitment? Are they top-tier? Why not try branching out to other universities you may not have approached, “post-92” universities perhaps? If you do not have the budget and bandwidth to visit lots, then consider plugging in to our careers fair series. Our events attract engineering and tech students from all universities locally at each city where we have a presence. And since we’re sector-specific, you will know you have qualified candidates coming up to your stall all the time. Do you rely on assessment centres and group interviews as a mechanism for filtering your talent? Remember, not everyone will excel in such environments. Some people from a neurodiverse background will find this quite difficult and hence may from your perception, underperform. Consider alternative assessment methods to enable everyone to flourish and perform their best. Careers Fairs – focussed on apprentices, graduates, returners hence relevant for emerging talent and experienced hire talent. Taking place nationwide in October 2019. Job Board – advertise your roles year-round to our growing network and visitor traffic. Create an employer profile on our hub page for showcasing how you support diversity and inclusion. Content is used in our social media channels. Set for Success Training Programme – Launching in London on 10thJuly 2019, this programme will bring together engineers to explore topics such as leading with difference, understanding oneself and others, personal impact, role model case studies and inspirational speakers. There will be a peer-mentoring element supported through creation of an online community, and a possible site tour to an energy production facility. Equality in Engineering Conference 2020 – Feeding from the success of our inaugural conference in 2018, our event will return connecting and empowering those people championing change in their engineering and technology businesses. Read our 2018 conference report here. Engineering Talent Awards 2020 – We will showcase the best of the best at our 2020 awards ceremony through a mixture of individual and organisational categories. We want to use the platform we have created the raise the profile underrepresented talent and highlight the good work being done by our growing community of role models and partner organisations.